From small shops and restaurants to large corporate offices, all businesses need to ensure that their properties, assets, and employees are secure from outside threats. At the same time, they must maintain an inviting appearance for customers and members of the general public. When designing commercial properties, balancing security and curb appeal can present a major challenge—but wrought iron fencing offers a versatile solution. Reliable protection for the property and its assets. Wrought iron’s natural durability makes it an excellent choice for security purposes. Due to its strength, it is very difficult to damage, and unlike chain-link and other types of fencing, it has few handholds and footholds that would enable unauthorized entrants to climb it. 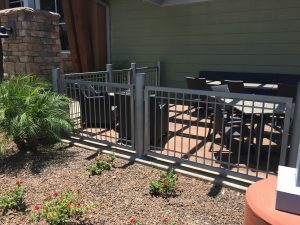 When enclosed by a high-quality wrought iron fence—such as those manufactured by DCS Industries—businesses will be protected from vandalism, theft, and other threats for years to come. Safety for employees and customers. In addition to protecting their properties and valuable assets, businesses must ensure that their employees, customers, and any other visitors to the property feel safe and comfortable. By creating a deterrent to trespassers and granting property owners greater access control, commercial security fencing—particularly if it includes gates—helps to enhance safety for employees and customers. Better curb appeal. The term “security fencing” is more often associated with menacing, unattractive barriers than with aesthetically appealing fixtures that surround a property. However, one of the best features of wrought iron is its timelessly elegant appearance. From sleek and contemporary to ornate and decorative, wrought iron can be shaped to accentuate the style of any property. Wrought iron fencing from DCS Industries is also available in a variety of colors and carries the options of powder coating or electrostatic painting, which ensure a high-quality finish. With its attractive appearance and long-lasting durability, wrought iron security fencing can improve public perception of your business while securing your property, assets, employees, and customers. At DCS Industries, we have over a decade of experience in designing, manufacturing, and installing wrought iron fences and gates for various types of properties. By using premium-grade steel and other top-notch materials, we make sure that our products are great long-term investments for any business. Our customers may choose to have any wrought iron products galvanized, a process that involves applying a protective zinc coating to the wrought iron and carries a ten-year warranty against rust. To learn more or request a free estimate, call us at 623-825-7700 today!